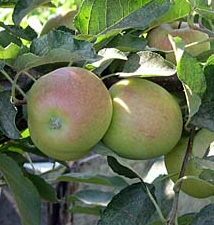 A result of breeding Kidd's Orange Red and Golden Delicious apple tree varieties, Gala (Malus domestica 'Gala') hails from New Zealand and was first produced in 1934. Noted for its reliable crops of apples, which are good, small, crisp and well flavoured with a thin skin. Without doubt one of the most popular eating apples in the world. Improved colour forms are grown commercially such as ‘Mondial' and ‘Royal' Gala which appear in the shops. Type of Apple: EatingSelf-fertile/Not self-fertile: This apple is not self-fertile and requires another apple to act as a pollination partner. This apple is in flowering period is C4 and so needs another apple tree nearby from groups C3,C4 or C5 to produce apples..